Well maintained family home for sale in the Midi Pyrenees. This lovely village house with courtyard is a great family house where you could easily set up a chambres d’hotes or self-catering holiday home or gites. This authentic house with enclosed garden and swimming pool is very suitable as a holiday home in France or as a family home in France. If you are looking to buy a holiday home or a second home in the south of France, take a look on the website and make a virtual tour. The house or gite sleeps 10 to 12 people and is ready to move into. 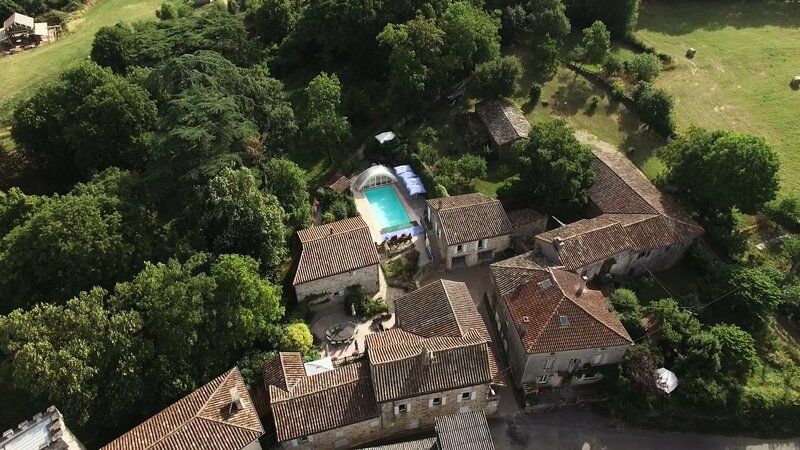 For letting out as a gite, this holiday home with covered pool offers lots of possibilities. You can use it as a second home in France, or as a holiday home in France or start a B&B. Having a Bed&Breakfast accommodation provides a pleasant source of income. Your holiday guests can have breakfast in the lovely courtyard with heated pool. This French house in a beautiful setting is worth a visit. The holiday home in France is close to the historic towns and cities such as Albi, Toulousse, Montauban, and the Gorges du Tarn and the Gorges de l’Aveyron ar not far away. Also the historic town of Saint Antonin Noble Val, where several films have been taken, as well as the medieval Cordes sur Ciel are only a few miles away. Looking for a second home in the south west of France? Think of the Tarn Department in the Midi-Pyrenees Region, where you find this stunningly renovated family house in a characteristic French village with lots of privacy, tastefully rebuilt with the use of solid materials. This maintenance friendly cozy holiday home with authentic details and swimming pool can be moved into. No renovation necessary, but move into France without hassle. This French area offers everything: French villages, French towns, French markets and unspoilt nature. Many touristic features make this holiday home very attractive. The area is great for cycling, hiking and wine tasting in the vineyards of the famous Gaillac wines which you find next door of your French home. Don’t miss out on a wine tasting tour and try the red wines and white wines of the Gaillac vineyards.